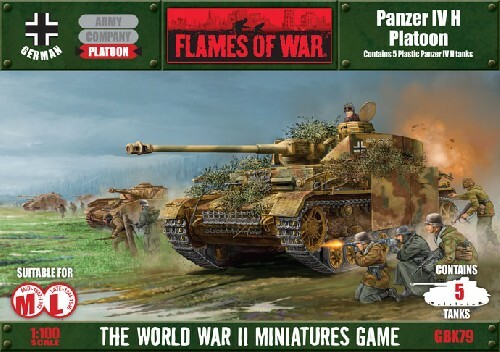 includes five plastic Panzer IV H Medium Tanks, one plastic Tank Commander sprue, ten Rare earth magnets & one Decal sheet. Panzerkampfwagen IV Ausf H entered production in April of 1943 as the ninth variant of Panzerkampfwagen IV tank family. Designated Sd Kfz 161/2 it was produced between April 1943 and July 1944 when it was replaced by the Ausf J. It was the most produced of all the Panzer IV variants with 2,774 tanks produced and another 30 hulls being used for early StuG IVs and 130 for Brummbärs. It was produced by Krupp-Gruson AG in Magdeburg, Vomag AG in Plauen and Nibelungenwerke AG in St.Valentin.